Her definition of homicide? Performance Rights Act (HR 848), a bill that would require radio stations to pay royalties to artists for playing their music. The potential winners and losers in the bill being considered by Congress has been a source of heated debate. But it clearly would dim the already free-falling profits of Hughes’ company Radio One, the nation’s largest chain of black radio stations. Now, your average multimillionaire business mogul might respond to a congressional threat by heading directly to K Street to hire the most powerful lobbyist money can buy. But we are talking about Cathy Hughes, BLACK multimillionaire business mogul, someone who has a long track record of using the airwaves to throw her weight around on behalf of the Darker Nation. Thus Hughes’ calculus for the “Reality Radio” spots goes something like this: I am a black person + my business is under threat = black people are under threat. In another spot, Hughes goes after the bill’s sponsor, Rep. John Conyers—or rather, she details corruption allegations against his estranged wife. (She even points listeners to a Web site where they can learn more.) “What is it that John Conyers of Detroit, Sheila Jackson Lee of Houston, Hank Johnson of Atlanta, Mel Watt of Charlotte and Bobby Scott of Richmond don’t understand about these facts?" But longtime Radio One listeners like Debra Brooks, a 56-year- old constituent in Lee’s Houston district, are the ones who don’t get it. Brooks has no opinion on HR 848, but she doesn’t like the smell of the smear campaign against Lee. Don’t look for established media outlets to speak out. As if her own 12-million-listeners-strong platform was not enough, Essence magazine gave her more space to lobby against the bill. The magazine even included a nifty sidebar that detailed all the financial sacrifices, furloughs and the like that Hughes has made to “keep black radio alive.” Pretty rich, given that Hughes and her son, Radio One CEO Alfred C. Liggins III—who control 88.3 percent of the votes at Radio One’s shareholders meeting—seem to have seen the writing on the wall. They’ve already begun to cash out. The Washington Post reported last year that Liggins got $5.8 million in non-salary compensation plus an 8 percent cut of TV One profits from Radio One. This is in “addition to his base salary of $575,370; last year [he] earned a bonus of $468,720 for turning in the worst financial performance in company history,” Post columnist Steven Pearlstein noted. In some ways, the snatching of the jewels from the Titanic is no different from, say, the Tribune Co. newspaper chain executives arguing that their top 700 managers must collect $66 million in bonuses this year—after the bankrupt conglomerate enacted massive layoffs in its newsrooms. The only difference is those newspaper executives aren’t rallying the public to their cause as if they are the Second Coming of Martin Luther King Jr. as they do it. Somehow, Hughes has managed to frame the debate in mainstream publications such as the Chicago Tribune, The Hill and Politico as if it is a racial issue, a split among factions of the civil rights movement, tribal warfare among the Negroes. But this is not really a racial issue. As Mark Anthony Neal puts it, this debate is really about two industries, music and radio, that are having their business models upended by new technology and are now fighting over the remaining scraps in a bad economy. There is no question that the bill, if passed, will affect the company she has worked so hard to build. (As it will affect other radio companies.) But Hughes needs to admit that her campaign is all about her business’ survival, and not about uplifting the race. Given that, it is surprising how few people have been willing to talk back to the woman behind the microphone. Industry Ears founder Paul Porter tried to correct some of the more blatant distortions in Hughes’ campaign, and he also gently chided her for her tactics in an open letter. True to form, Jack & Jill Politics cut through a lot of the BS. Black Agenda Report's Glenn Ford noted how over the course of this fight over HR 848, how Hughes has been quick to slime some Congress members, and reward others. And Dionne Warwick took to the Huffington Post to try to fight back and defend her name against HR-848-related smears. Clearly, this is a rhetorical question. Even on the “Reality Radio” Web site, visitor comments have been disabled. 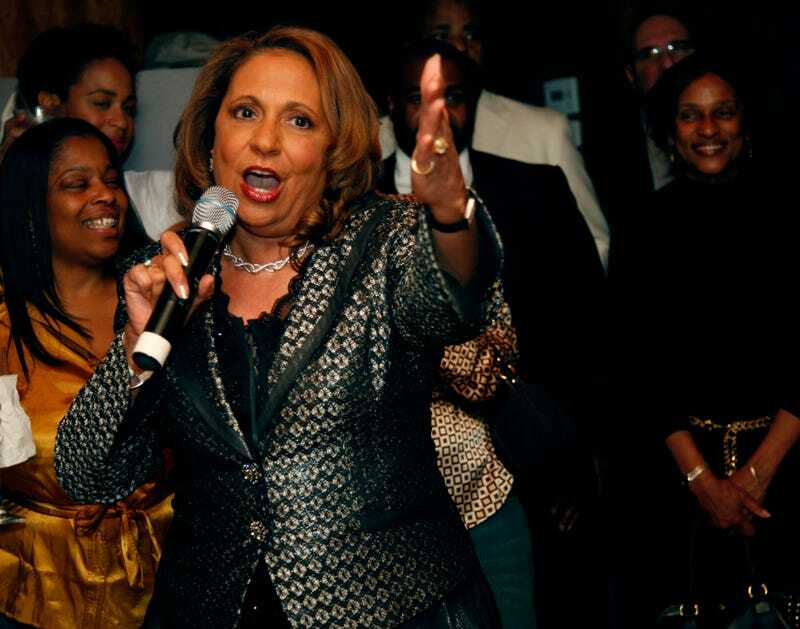 So Cathy Hughes, if you’re reading, here’s my reality: I’m a black mom, living in a black neighborhood that I must drive out of each day in order to provide my black kids a decent education at a good school, so that they’ll have a fighting chance. We commute via a 9-year-old, beat-up SUV that’s paid for—but whose CD player works only with the assistance of a paper clip. My reality is that because I love black music, and because I don’t want to divorce my black husband over whether the dial is set to NPR or sports talk radio, we are among the millions of Radio One listeners who have been held hostage for the past several months by your disingenuous, juvenile and bullying propaganda about what HR 848 would mean for us. Do you really want to know my reality, Cathy? You have a lot of damn nerve asking for my help.